The table above shows the influences not only on the Lycian Tradition, but also, other organizations well-known in the Pagan community. The dates underneath each entry indicate the earliest documentation for the existence of that organization. Some of these organizations may have existed prior to those dates, but there is no documentation for it. The solid arrows show a direct physical connection between the organizations. The one "dashed arrow" indicates a spiritual connection of practices, experienced in the astral realm and then later validated through research, which reveal an initiation was experienced similiar to those spoken of in Inquisition records, without previous knowledge of those same records. If you have a comment, or would like to ask a question about Lycian Wicca email us. 2. Wolf Clans / Benandanti: "Night Battles" by Carlo Ginzburg. The John Hopkins University Press, Baltimore, Maryland 21211-2190. 1992. 3. Co-Masonry: "Mackey's Revised Encyclopedia of Freemasonry, Vol. I" by Albert G. Mackey. The Masonic History Company, 2831-33-35 South Park Way, Chicago 16, Illinois, U.S.A. 1909. 4. The Golden Dawn: "What You Should Know About the Golden Dawn" by Israel Regardie. Falcon Press, Phoenix, Arizona 85012, U.S.A. 1985. 5. Ordo Templi Orientis: "The Secret Rituals of the O.T.O." edited and introduced by Francis King. Samuel Weiser, New York, New York. 1973. 6. Early Wicca: "Crafting the Art of Magic, Book I: A History of Modern Witchcraft, 1939-1964" by Aidan A. Kelly, Ph.D. Llewellyn Publications, St. Paul, Minnesota, 55164-0383, U.S.A. 1991. 7. 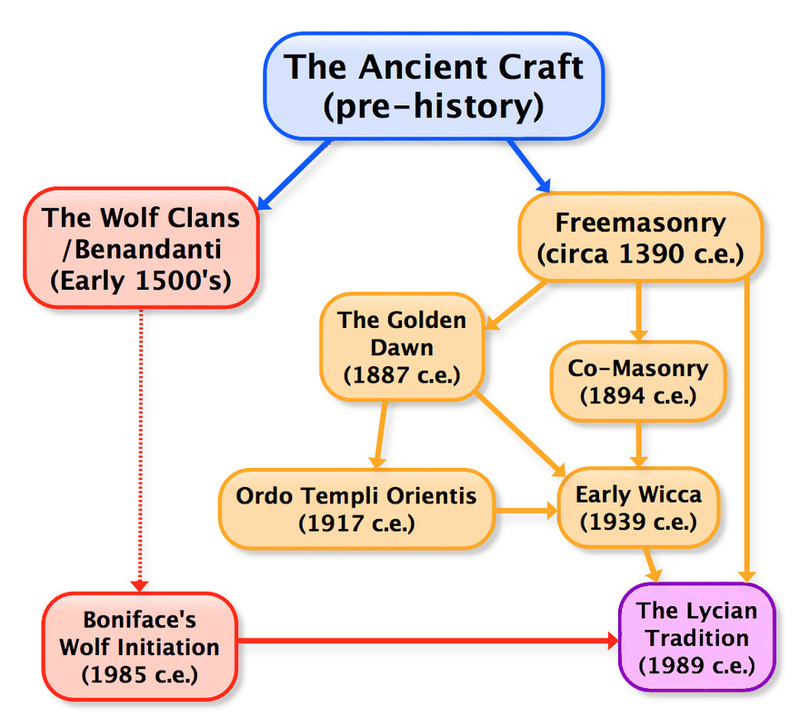 Boniface's Wolf Initiation: Boniface went through a series of astral initiations, over a period of years, culminating in finally being initiated and accepted by the "Wolf Clans" in 1985. 8. The Lycian Tradition: Began in 1989 when Boniface formally initiated "Rashal" into the tradition and started the first modern Lycian Coven, later named "Wolfsong."